Barbara Muir Paints: What is it worth? that are small --12 x 12 inches say, take as much time as some larger works. outrage on the faces of some of my artists friends at that one. other worldly craft that didn't require financial recognition. eyebrows when an artist charges a decent price for a painting. earning something for their beautiful ideas. family money, or a spouse who foots the bill. a week, and sell five days a week. I raise a glass to those artists. I get my work from people who see what I do and want it. well as their appearance -- but I do it in my own artistic language. our ever changing personal mark, and we continue to learn. the richness of his vision. Labels: Vemeer. What to charge? You are worth it. 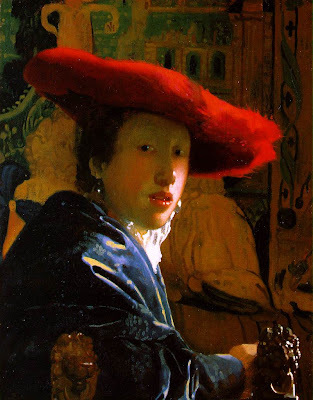 That there Vermeer dude sure could paint! Was he from New Jersey? I'm right there with you, and so glad to be having a conversation about it. She makes a number of good points, but they are founded on two principles: 1) don't price your work below what it takes to produce it, and 2) get a feel for "market prices" by looking at what comparable work is selling for. The first, unfortunately, is a straightforward calculation: materials + time + overhead = cost. Time includes development, pre-work and research, and its value is set by you (Say you need $50000 a year to live off of. Then your hourly rate is at least $25, full time). Overhead is an estimate of what your studio costs (rent, etc.) and other work-related expenses (utilities, storage, shipping, etc.) are per year, divided by your average number or pieces per year (or the hours you use it per year). So, this number becomes your cost, BELOW WHICH YOU WILL LOSE MONEY WORKING ON ART. Anything you gain from sales over that number per piece is profit-- not a dirty word if you are selling your work, and not your soul. Then take a look at the market (and not just the local market) to see what others like you are charging for work. Quality counts, in lieu of experience or notoriety. Hopefully, the market is paying more than your costs per piece (on average). But in any case, you must have enough built into the price that you will be able to pay out commissions and consignment fees, and still cover your costs. So, you see, she does suggest considering hourly rates in pricing, but only as a way of assigning a cost to your time. Overhead can be considered as an hourly expense, too, but it can get complicated. However, this approach skirts the central issue I think we artists can be hung up on: work that is "near and dear" to us. Some work is of such high personal importance, that this formula fails. In that case, either the 'premium' added to the cost is high enough that we feel fairly compensated for the portion of our soul that goes with the sale, or the work is simply NOT FOR SALE. One thing I ask artists in this quandary is, "You did this once, could(n't) you do it again? If you sold this piece, could you make another for your own keeping, that you'd feel good about?" Your point about taking commissions that allow you to paint on your own terms, without preconditions from the client, is central to retaining your artistic integrity. Good for you! But what about work that isn't commissioned specifically, when we make work that "no one asked for" -- is it actually for a market, rather than what really gives us joy? This is the dividing line of 'authenticity', and is also where artists can go afoul and "sell out." Poor Vermeer. If only he had copyrighted his image in perpetuity, and sold, not the work itself, but a license to look at the work temporarily, and had a contract to collect royalties for his estate from each time the license is resold... Oh, wait, then he'd be a record company, not an artist. Whew! I paint to sell. That doesn't mean that while I'm painting I'm thinking about selling at all. It means that what I make is for sale. Of course I keep work that I want to keep, but most of my work is for sale. building. I know that each artist sees this differently. That's how I see it. I'm not a commercial artist, but I am an artist engaged in commerce. Love your thoughtful blog, and comments. You do get me thinking and writing. Very interesting discussion! I agree to just about everything that's been said. Meanwhile ( after having emancipated from the art school snobism) I have grown into looking upon my work as my JOB and only since then I actually paint regularly and manage to earn money with it, which at last gives me the possibility to paint as much as I like because I don't have to spend my time at another job! And the more I paint the better I get, the less difficulty I have with asking an appropriate price for it.